The Seventeenth Judicial District Commission on Judicial Performance unanimously recommends by a vote of 9-0 that Chief Judge Patrick T. Murphy BE RETAINED. Judge Murphy was appointed to the District Court in 2008, and was appointed as the Chief Judge of the Seventeenth Judicial District in 2014. 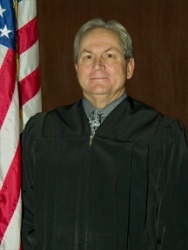 Judge Murphy received his bachelor's degree in 1972 and his law degree in 1975, both from the University of Colorado at Boulder. Prior to his appointment to the bench, Judge Murphy served as both a state and federal prosecutor before entering into private practice in 1986. In his private practice, Judge Murphy litigated both civil and criminal cases in federal and state courts. In his role as Chief Judge, Judge Murphy manages the staff and operations of the judicial district. He also works closely with the communities of Adams and Broomfield Counties and serves on many state-wide committees that strive to improve the judicial system in Colorado. Judge Murphy was awarded the Justice Department Distinguished Service Award in 1985 and the Heart of Broomfield Award for Community Service in 2014. The evaluation methods used by the Commission included a review of legal opinions authored by Judge Murphy, a personal interview by the Commission, in-court observations by Commission members, and a review of Judge Murphy’s Self Evaluation. Surveys distributed to both attorneys and non-attorneys, associated with cases brought before the judge, provided statistics that were integral in assessing Judge Murphy’s effectiveness. Among the survey questions was “How strongly do you recommend that Judge Murphy be retained in office, or not be retained in office?” Of attorneys completing the survey, 84% recommended retention, 8% recommended non-retention, and 8% had no recommendation. 93% of responding non-attorneys recommended retention, 6% recommended non-retention and 2% had no recommendation. (These percentages may not total 100% due to rounding). As the Chief Judge, Judge Murphy has a diverse docket including: 5% Mental Health cases, 60% Probate cases, 30% Criminal cases, and 5% Water cases. Judge Murphy received ratings from non-attorneys that were higher than average for all district judges standing for retention and average ratings from attorneys. In his evaluations, Judge Murphy was consistently described as being "fair," "compassionate," and "understanding" in his handling of very difficult and sensitive cases. Judge Murphy's written decisions are well-written and well-reasoned. During his interview, Judge Murphy spoke of his commitment to his role as Chief Judge and his management responsibilities. He was described by other judges as being a dedicated and effective Chief Judge. The Commission believes that Judge Murphy's strengths as a judge and a leader are assets to the Seventeenth Judicial District. Based on its review of post-case surveys, courtroom observations, several of Judge Murphy’s written decisions, and its interview of Judge Murphy, the Commission unanimously recommends that Judge Patrick T. Murphy BE RETAINED.